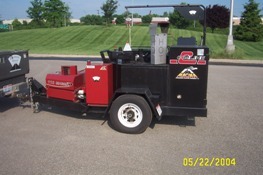 "Serving Southwest Ohio , Northern Kentucky , Southeast Indiana"
Hot Rubberized Crack Sealing of asphalt and concrete- keeps water from destroying what is supporting your pavement. Fuel, wear & oxidization resistant surface coatings for blacktop (seal coating)- precise application with our patented, exclusive computer controlled pumping system of our special formulated Paveflex coating system. Recreational surface repair and coating- repair of cracks and depressions. color coating of tracks, tennis courts & basketball courts.